Nonprofit professionals know thanking donors isn’t just as an expression of gratitude and good manners, but rather a way of building relationships. When done properly, donor recognition can encourage future gifts and continued involvement, whether it’s volunteering, fundraising, or becoming an ambassador. Below, we rounded up 15 creative and meaningful ways you can say thank you to delight your supporters and deepen your relationship with them. Since so many people come through your main website, it’s a great place to showcase public appreciate about and for your supporters. To take advantage of this opportunity, you can develop a section on your website that acknowledges the commitment of your supporters: one-time donors, recurring givers, peer-to-peer fundraisers, etc. You can post messages to this part of your site that promotes your thankfulness and shows your appreciation for the time, effort, and impact these individuals have made to your nonprofit. 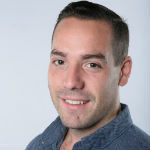 This is a personal connection to your supporters that can boost engagement with fundraising campaigns and loyalty to your organization. For bigger names, donors, and partners, you can up the ante and call them out in a more predominant way like Food Bank Santa Barbara County does here. 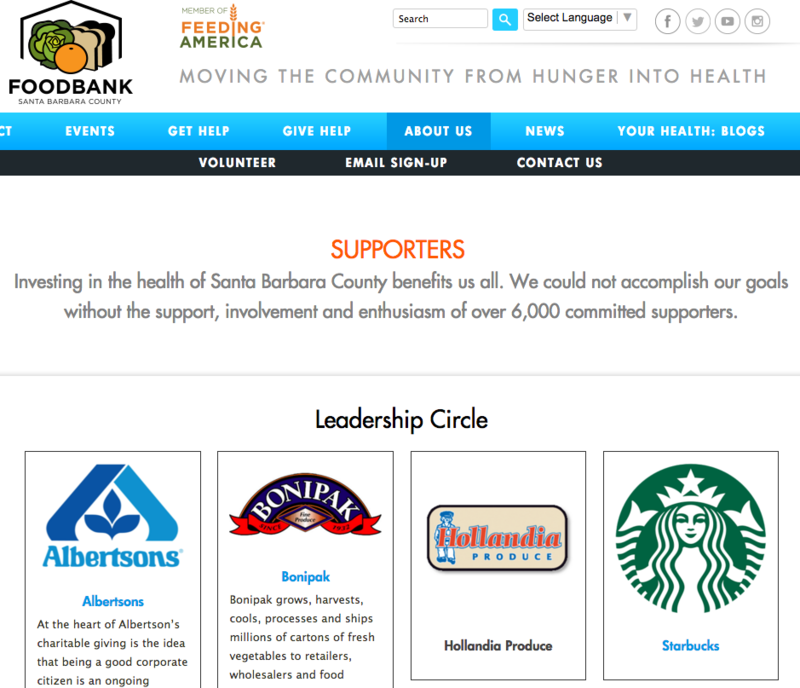 The Food Bank Santa Barbara County donor recognition page. A welcome package is an effective way to educate new donors about your nonprofit while also showing them you care about their decision to support your mission. In that light, it’s important you send off the package to your new donors no later than two weeks after they’ve made their first gift. Typically, welcome packages go beyond simple donation thank you letters, although that’s certainly an element to include. They can also include items like photographs of your beneficiaries, a well-written story about your nonprofit’s impact, or even small gifts like a t-shirt, sticker, or bookmark. Remember, this is a package designed as a creative way to say thank you and welcome donors to your community. It shouldn’t be a laundry list of series, facts, or figures about your nonprofit. Show the difference your nonprofit has made in the world, and let donors know how they’ve helped. In that vein, your annual report is also a way to highlight your top-contributing donors by name and recognize their efforts. However, this kind of profiling isn’t restricted to only your annual report. It’s a tactic that can, and should, be used year-round in things like newsletters, marketing materials, emails, and social media to showcase their commitment to your organization. Video is a powerful medium because it has the potential to capture imaginations and stir emotions through vivid images, well-crafted dialogue, and powerful music. It’s a tool commonly used by nonprofits to market and communicate with the public, and it has a wide variety of use cases. For example, video can be used to clearly and simply acknowledge and thank supporters for their donation. A two-to-five minute thank you video will not only engage your donors, but is an incendiary tactic to publicly promote and recognize the hard work of your dedicated supporters. A donor cultivation event provides a fun and social setting for your nonprofit to get to know donors on a personal level. You can present your need face-to-face through an immersive experience centered on your mission, impact, and work. And when it comes to inviting people, this is an opportunity to bring together potential new donors, lapsed donors, or powerhouse donors: anyone who would be encouraged to support your mission by attending. Keep in mind that this is a purely social event. The overall experience shouldn’t be too serious or heavy, so try to avoid hard asks and instead engage in conversations about your donors’ interests. Along the way you can sprinkle in tidbits about your nonprofit like success stories or the impact you’ve made. Some attendees at your event might be a higher priority than others based on their financial bracket, length of relationship with your nonprofit, or potential to make an immediate gift. Make sure you plan for these individuals and how you can move your relationship forward with them during the event. 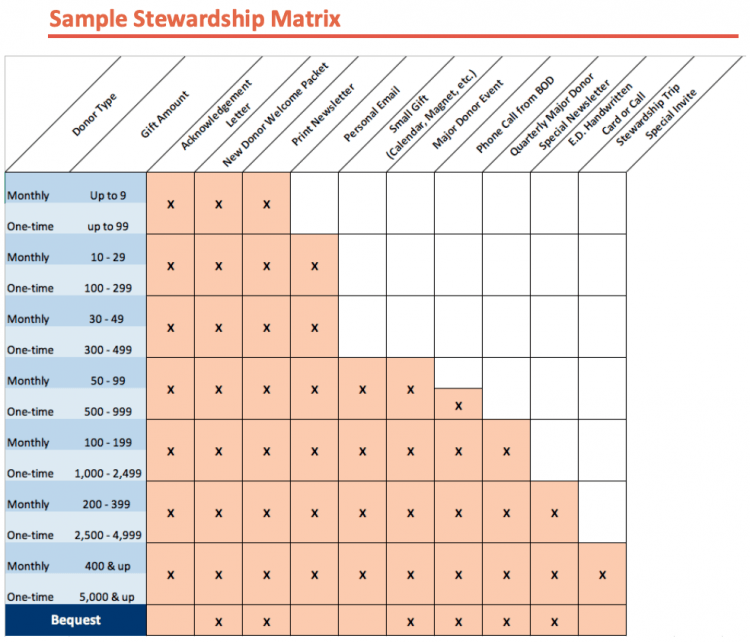 An example of a stewardship matrix. The purpose of a stewardship matrix is to help your nonprofit staff remain consistent when it comes to communication and stewardship strategies with each group of donor. One of the simplest ways to thank your donors and give them recognition for their gift is to send a donor thank you letter. It’s crucial that you send this letter no more than two days after you receive someone’s donation. The longer you wait, the less sincere your thank you could feel. That, in turn, creates a negative donor experience which could prohibit someone from returning to participate in future campaigns. Give because of their friend’s peer-to-peer campaign? Respond to a direct appeal? Designate a specific program they like best? When you know the motivation behind their gift you can provide an extra sentence or two that talks about the importance of their gift. For an added touch of importance, ask your board to personally sign the donation thank you letters. No matter how someone decides to support your nonprofit, every interaction you have with them is an opportunity to build a lifelong relationship and retain their support for years to come. In that light, it’s important you remain thoughtful about personal details you observe in conversation, either spoken or written, with your donors. For example, if someone tells you that they’re participating in a charity golf tournament in the future, ask how the event went the next time you speak. It’s details like this, and people feeling that you’ve heard them, which can motivate someone to return to your campaigns time and time again. When donors share feedback, either positive or negative, they’re opening lines of communication with you. It’s easy to respond to positive feedback, but when someone sends a complaint it can be a bit more difficult. Regardless, this is an opportunity for your nonprofit to quickly engage with them and, above all else, thank them for their input. When you get a complaint, it’s important you resolve any issues within 24 hours. If you don’t know how to respond to a complaint, a simple three-pronged approach of “aware, working, and update” will suffice. Essentially, this shows that you’re aware of the donor’s situation, working on the problem, and will update them as soon as you know more. If you can cover these three bases within a timely manner, it can go a long way toward making donors feel appreciated and valued by your nonprofit. Never forget to thank them for surfacing issues. It’s not a traditional thank you like you would normally send someone when they make a donation, but it’s important none the less. 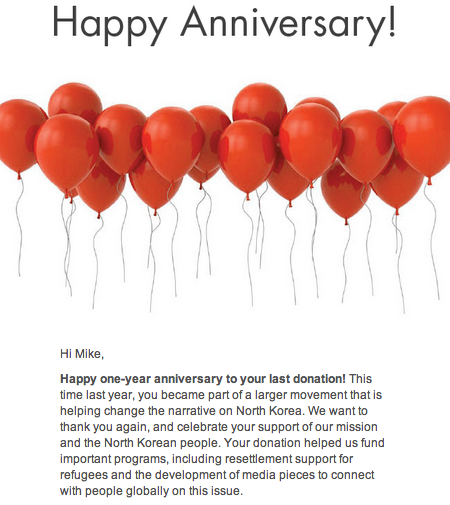 Send a personalized anniversary card to your donors one year after they made their first donation. To further show your gratitude in these donor letters, ask the chair of your board, executive director, or CEO to sign. Make sure to celebrate other major milestones in a donor’s lifetime affiliation with your nonprofit, like their five, 10, 15, and 20 year anniversaries. The longer someone has been with your nonprofit, the more personalized and exciting you can make your card. You can even consider sending a special thank you incentive, like an exclusive t-shirt, for larger milestones. 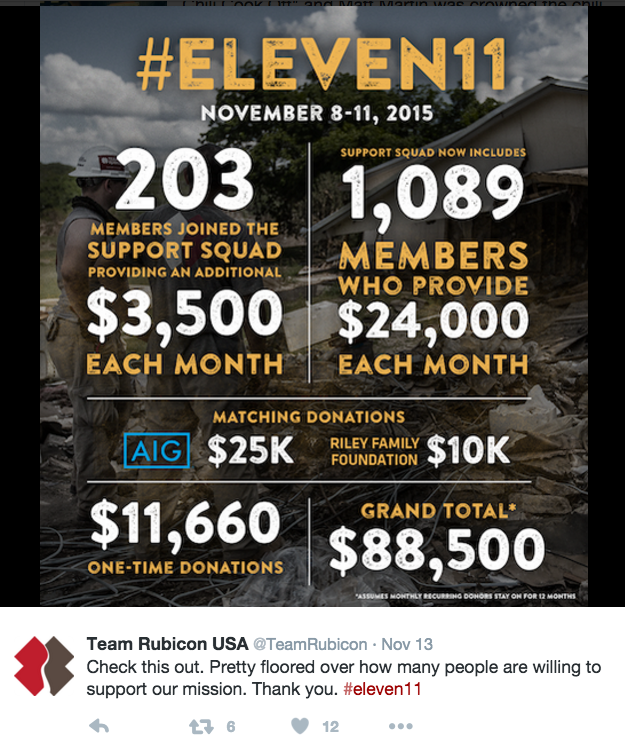 An example social media post from Team Rubicon. To ensure you have your donors’ correct social media information, add a field on your donation form to collect their usernames. Phone calls are deeply personal forms of communication, and they can build bonds of trust and authenticity between you and your donors. Make it a priority to schedule time on your calendar to speak with donors over the phone. For example, maybe you choose one major donor a month and make a concerted effort to get to know them. When you wrap a fundraising campaign, or finish a major project, it’s a general rule of thumb to share results with your supporters. After all, they’re the ones who helped fund your work. You can use this moment as an opportunity to go beyond a simple donation thank you and delight them with a photo book. Take the most powerful, funny, heartwarming, and results-oriented photos you have from your project and assemble them into a brief photo booklet for your donors. This photo book is tangible evidence of how their donations were put to use: they can see it, touch it, and share it. It may be difficult to find the budget to send one to each and every donor, so consider doing this for your larger or more dedicated donors. You can even include this on your stewardship matrix as a potential option. Take any chance you can to physically connect donors with your nonprofit. For example, you can invite powerhouse donors to visit your headquarters for an exclusive tour. On the route, they can engage with other donors like them, meet your staff, and even have small meetings with your team. This can cement your relationship for years to come. Thanking your supporters is a necessity. Not only does it help to strengthen relationships with your donors, it’s a great retention strategy. If you’re looking for more ways to keep donors coming back month over month and year over year, make sure to download our Donor Retention Handbook below: also available as an audio book. And if we left any creative ways to say thank you off this list please post them in the comments. Editor’s Note: This post was initially published in 2015 and recently updated to reflect current best practices. What Makes a Good Thank You?